Oil on canvas, mounted on board, 1857 ca. In 1824, Thomas Sully painted a study portrait from life of Andrew Jackson. The hero of the Battle of New Orleans was by then a U.S. senator and a Democratic nominee for president. Two decades later, Jackson’s ill health prompted Sully to copy his 1824 study portrait; the replica, which closely resembles the study, was completed shortly before Jackson’s death in April 1845. It is now owned by the National Gallery of Art in Washington, D.C. Sully used the replica as a model to create a full-length portrait of Jackson as the battle hero (this painting is now owned by the Corcoran Gallery of Art in Washington, D.C.). The National Gallery’s portrait was long assumed to be the original 1824 life study until it was discovered that the artist had not purchased the linen on which it was executed until the mid-1830s. The original 1824 study was privately owned by Mrs. Breckenridge Long in 1940, but its current location is unknown. The portrait now in the U.S. Senate was painted several years after Sully’s other Jackson portraits, probably in the late 1850s. Though it is clearly based on the 1824 and 1845 likenesses, it differs from these works in three distinct ways. First, the canvas is considerably larger, a result of a later mounting of the original canvas on another, increasing the size by four inches at the sides and top and by six inches at the bottom. This expansion necessitated painting an addition: the dark cloak below the collar (which has darkened into an undefined mass). Second, the pose is slightly altered. The characterization shifts from poetic and introspective to vigorous and engaged. The head tilts more, throwing the chin completely out of the vertical centerline. The chin also is painted more emphatically, with a strong highlight, which subtly alters the appearance of the face when compared with the 1824 and 1845 Sully paintings. Third, Sully’s mature style, as seen in the 1824 and 1845 Jackson portraits, is not congruent with that of the Senate painting. In the latter, the paint surface is built up and emphatic, exaggerating the appearance of the hair and the eyebrows, as well as the chin, creased cheek, and forehead. In contrast, Sully’s 1824 and 1845 Jacksons are painted with a light touch–-a fluidity of brushwork that creates an effect of transparency. 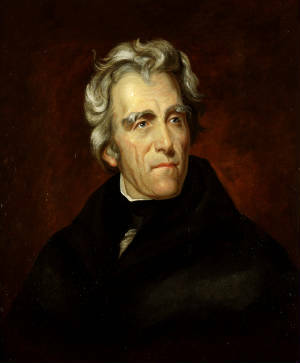 In the Senate painting, one finds repeated shapes and insistent rhythms (for instance, in Jackson’s hair) that are not found in the earlier portraits and do not seem typical of Sully. In addition, the skin tone is swarthy, a tone not typical of the artist or, for that matter, of Jackson. Engraver Thomas B. Welch introduced many of the stylistic exaggerations found in the Senate painting (especially in the hair, eyebrows, and facial furrows) in his 1852 engraved copy of Sully’s earlier likenesses. Although Sully might have replicated an engraving of his own painting, it is also possible that the Senate painting was copied from Welch’s engraving by another, unidentified artist. The provenance of the Senate painting, on the other hand, appears to support an attribution to Sully. On June 6, 1872, Garrett C. Neagle, son of the artist John Neagle and grandson of Thomas Sully, wrote to Architect of the Capitol Edward Clark to confirm receipt of two Sully paintings that Garrett Neagle had sent to the Joint Committee on the Library. The paintings, a portrait of Andrew Jackson and one of Thomas Jefferson, “painted by Mr. Thos. Sully in the years 1856 and 7,” were being offered for sale by Neagle for $300 each. According to Neagle, the Jackson portrait was “painted from studies taken from life” and was considered a fine likeness of the former president. After Sully’s death on November 5, 1872, Neagle wrote that the portraits now “should be worth to Congress, at least $500 each.” Clearly, Garrett Neagle had no doubt about the authenticity of the portraits, although he stood to benefit financially from their sale. The Joint Committee on the Library considered the matter at leisure and in May 1874 purchased the Jefferson portrait (for only $200) and returned the Jackson painting to Neagle. Half a century after Neagle’s first offer, a New York art firm offered the Jackson portrait again to the U.S. government. This time the Joint Committee on the Library authorized its purchase on March 1, 1922, for $1,200.